Kyrgyzstan has successfully lived through the spring, which promised to be very heated. Actively supported and directed by the west, the opposition managed to hold its “great rally” but it was unable to accomplish its goal of overthrowing the current government. Its plans to hold the country back from joining the Customs Union have also fallen through. There is a possibility that at the end of May, the issue pertaining to Kyrgyzstan joining the Customs Union will be reviewed in Astana. In any case, the road map has already been approved by the republic’s cabinet and is currently being discussed in the parliament. The Manas U.S. air base located in the Bishkek Airport will also cease operations in July. Nevertheless, Kyrgyzstan still remains an arena for the clashing of Russian and American geopolitical interests. President Almazbek Atambayev was able to outplay his opponents and block serious attempts at destabilising the situation. Of course, the threat still remains. Atambayev currently has every chance to completely take control of the country into his own hands and this option would only benefit the country for the foreseeable future. 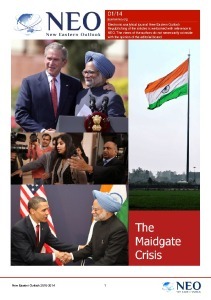 To modernise, the country and its people are in need of peace and political stability after a quarter of a century of strife. This is also especially relevant because the republic is entering another stage of parliamentary and presidential elections. 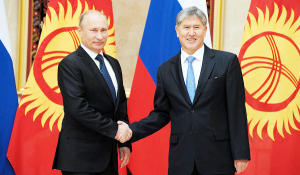 During his presidency which began in November of 2011, Atambayev was able to regain the trust of the country’s number one strategic partner – Russia. However, it was precisely due to his pro-Kremlin policies that the president was often criticised by the opposition. Leaders of the Kyrgyz opposition parties who were unsatisfied with the president’s foreign policy aimed at fostering closer ties with Moscow demanded that he resign. They claim that despite the fact that the republic is deemed a parliamentary one according to the constitution, the president still continues to de facto rule over all of country’s key processes. At their April rally, which promised to expand into a new Kyrgyz revolution, the opposition demanded for the government to step down. The reason – the country’s strategic facilities are being transferred into Russian ownership and the republic will thereby lose its sovereignty. The project of transferring the shares of the Dastan Transnational Corporation, a manufacturer of torpedo components important for the Russian military, has been discussed over a number of years. In soviet times, the Dastan plant specialised in manufacturing high-speed VA-111 Shkval torpedoes that had no equals abroad. 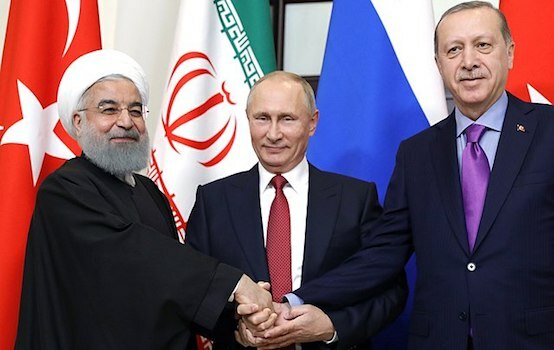 Understanding Russia’s special interests in the matter, Kyrgyz authorities aimed to receive as many preferential advantages as they could for Dastan’s operations, and at times they even blackmailed Moscow with the proposition of selling the plant to Turkey. Another point of criticism is transferring the country’s largest gas business Kyrgyz Gas to Russian Gazprom for a symbolic $1. Opponents accused the president of making the country an appendage that is completely reliant on Russia. However, in the end, whether it was the citizens growing tired from endless revolutions or whether Atambayev was finally able to overcome the situation and receive the necessary support from the citizens, the opposition’s activities finally fell through. “It is impossible to lose sovereignty and independence due to transferring a portion of a country’s financial assets, especially if these assets are being managed as part of intergovernmental agreements, in this case, between Kyrgyzstan and Russia. There isn’t even a threat of losing financial independence. And it is precisely the loss of financial independence that could be the basis for initiating any procedures relating to the loss of a nation’s real sovereignty. They are not politically linked at all,” commented Head of the Economics Department at the CIS Institute Aza Migranyan. According to the expert, the opposition rally was of a “populist and political nature”. Over the republic’s 20 years of sovereign existence, its authorities were not able to significantly increase the effectiveness of using the republic’s existing assets. Unfortunately, no foreign players currently exhibit any interest in investing into these facilities. “Furthermore, Kyrgyzstan is currently part of the system of market relations, as is the rest of the world. When we talk of these relations, we need to understand that receiving any sort of concessions and privileges can never be a one-sided matter. The creditor needs to always be provided with certain material guarantees. No government will provide endless subsidies for Kyrgyzstan, not even Russia,” Migranyan stated. Moscow heard the criticisms from the Kyrgyz opposition. As a result, one of the Russian projects was halted – Rosneft backed down from its offer to buy a share stake in the Manas International Airport and thus abandoned the idea of participating in investment projects to create a civil air hub at the airport. President Atambayev announced this during his official trip around the Talasskaya Oblast on April 17. “The Russians have declined to purchase Manas Airport shares. There are some people now who say that I am allegedly giving away 51% of the airport’s shares to Russians. Yesterday, the director of Manas came to me and said that the head of Rosneft Igor Sechin told him, ‘If right now, when we aren’t there yet, the Kyrgyz people don’t want to let us work, then we don’t need 50% or 51% of your shares. Find yourselves another partner,’” Atambayev told the people of Talas. In addressing the population of the Talas Province, the head of state lamented that instead of strengthening the country, there are some troublemakers who lead the people away from the right path and lead them astray. “And the loudest of them all is a Talas ‘dzhigit’ who heads the rest of them,” the president stated pointing to the opposition leader Ravshan Dzheenbekov. According to Atambayev, the opposition “inflames the situation around gas”. “They yell that, supposedly, Atambayev gave Kyrgyz Gas away for a dollar. With the arrival of Gazprom, Uzbekistan turned off our gas. Do you know why? They want Gazprom to come to them too. Please remember how for 20 years, every winter all of our officials would go bow down to Tashkent. Now the situation has finally changed, and changed for the better. Gazprom will clear the $40 million debt owed by Kyrgyz Gas. Gazprom will attract over $600 million to the sector. It will begin surveying for gas deposits in our country. Gazprom CEO Alexei Miller has told me that at the very least, they will lay a north-south pipeline so that we wouldn’t have to go and bow to our neighbour,” Atambayev stated. The president was talking about Gazprom’s plans to develop two deposits in the south of the country – Kugart and Eastern Mailuu-Suu-4, which will in the future allow the country to produce a large amount of their own gas. “There is currently not a lot of gas being produced in Kyrgyzstan, just a little over 30 million cubic metres. To be self-dependent in terms of gas is a good goal. We will begin prospecting in the coming days. We have already prepared the necessary technical documentation. Only 25% of Kyrgyzstan is currently supplied with gas. We have made a goal for ourselves to increase the country’s access to gas. Around 6-7 years ago, the consumption of gas in the country was a lot higher,” stated Gazprom CEO Alexei Miller. Another topic that leads to political debates is Kyrgyzstan’s entry into the Customs Union. President Atambayev also noted during the meeting with Talas residents that opponents are calling for the country not to enter the Customs Union, pointing to a possible increase in prices. The president addressed the public, “Let us say that we don’t enter the Customs Union. If the price of fuel increases two-fold tomorrow, do you think that prices for other goods will remain the same?” He reminded residents that presently the price of fuel is a lot cheaper in Kyrgyzstan than in Kazakhstan, Uzbekistan and Tajikistan. The revived oppositional activity is being linked with funding from abroad. The newspaper Delo No. recently reported that local non-governmental organisations received over $20 million to ramp up protests in the country. The increased funding for the opposition can seemingly be described as an attempt by western circles to save the Manas military base, even if the price is changing the country’s top brass. Viktoria Panfilova, staff writer for “the Independent Newspaper,” exclusively for the online magazine “New Eastern Outlook”.